Cosplay. So many people have asked me “What is Cosplay? How do you do it? Where do you go? Why do you do it?” I’m pretty sure you will get a different answer every time you ask a different cosplayer. For me, I never grew out of pretending to be the characters from my favorite Saturday morning cartoons or the borrowed comic books I loved so much. The only difference in being an adult is that I am able to get down and dirty with crafting madness to bring these characters to life. I don’t need Halloween as an excuse to wear a costume. There is a huge community of cosplayers all around the globe who step into costumes and act out as their favorite characters. They appear in comic conventions, local comic book shops, and charity events. 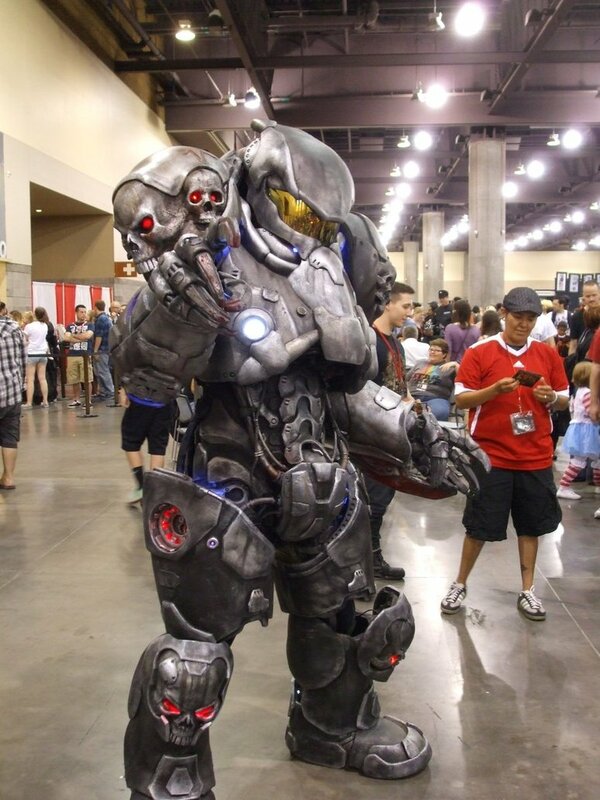 To sum it all up, cosplay is interactive costuming which is in turn cos(costume) play. I started cosplaying unofficially when I was about ten years old. We had a finished basement that my mom set up as our play room. Growing up with a mom who loves thrift stores created a child’s heaven of random toys, dress up, fabrics, crafts, and movies. Somehow, mom scored this old school video recorder that she gave to my sister and I. We would spend countless hours making home movies using the sea of fabrics and craft foam to create costumes, using toys as props to recreate our favorite movies, and sometime writing our own script. Needless to say, the costumes weren’t that great, but created my foundation for this hobby I love so much. As I grew and my love for sci-fi expanded, I started to attend sci-fi and comic book conventions. I saw more and more extravagant costumes with elaborate details and designs- and I fell in love. I had to learn how to do it! I enrolled in a vocational fashion design class so I could learn how to sew. I read TONS of forums and how-to blogs on prop building and DIY sewing patterns. I even took a shop class to learn how to use tools. My skills are growing with every cosplay I make and by no means am I the best cosplayer on the block (or far from it), but I used all outlets I could access to gain basic skills to learn how create this stuff! Not to mention Youtube is oh so helpful. When you speak to other cosplayers, it is amazing to hear how they build some of their props. Nothing in their home goes to waste! Old paper towel rolls, plastic scraps, old worn jeans, tupperware, leather jackets from the 80’s are all useful. Anything and everything can be repurposed for a costume. Hoarding is your best feature when you are a cosplayer. Forget a junk drawer, designate a junk room! Other must have items for your cosplay: eva foam, a heat gun, hot glue, mod podge, and foam board! These are treasured items in the cosplay community. There is a huge variety of materials you can work with, but these are the basics and easiest. Among them Eva foam is a favorite. What is Eva foam you ask? They are those little cushy puzzle piece mats your babies used to crawl on. This foam is moldable with a heat gun and works wonders for props and armor. But for every amazing costume, there are quite a few disasters. Proper face and body makeup is another asset to your cosplay which can really make or break your costume.Dear Hulk, I can guarantee the reason people are running from you is not due to the fear of being smashed, but the fear of your grease body paint smearing on their $300 costume and ruining 1000 man hours of construction. I can’t tell you how many Harley Quinn’s I have seen at EVERY SINGLE CON with blotchy, running, smeared, white faces. Knowledge is power, and knowledge of do’s and don’ts of body paint is so important. Please, for the love of all that is costuming, do not buy the $2.00 cream/grease makeup located at your local party store. You will melt off before you reach the con. We have all been there, I have as well, and that is how I was introduced to the world of professional face paint. I was looking for high quality paints that would last and look great. For about $10 you can get great quality paints at Silly Farm Supplies that look professional and will not transfer to you or your friend’s costume. Lastly, I want to close with how much fun comic conventions are to attend, or any convention for that matter! You have the opportunity of meeting the most amazing people, networking, and joining an entire community full of inventive, and amazing people. You will find incredible artist and tons of collectibles. The highlight of many conventions is the costume contest. This year at Florida SuperCon, I entered the competition for the first time. I was nervous, impatient, and terrified that I would fall off the stage. I know it’s silly, but I’ve witnessed it before! It is so encouraging and empowering as you step on stage in front of thousands of people who are cheering you on as you display your blood, sweat, and tears in all the hard work you’ve put into your costume. It is so rewarding! I recommend it at least once for any cosplayer to do! If you ever have questions on Cosplay, I am always willing to help and throw my 2 cents at you feel free to email me anytime at Ashley@sillyfarm.com ! This is my passion! It is what I love to do! I hope one day you might stop by your local comic book store, take a step into your childhood, and have the memories flood back. You will never see the geeky kids the same.